Former Chennaiyin FC midfielder Andrea Orlandi has retired from football due to heart disease. Orlandi, just 34, found out about his heart condition when he was undergoing a medical for Italian Serie C (third tier) side Virtus Entella. 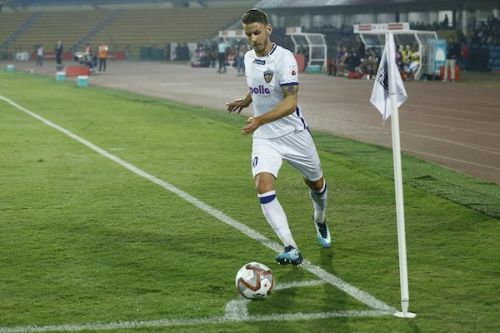 Orlandi last played for Chennaiyin FC in their January 26 game against NorthEast United in Guwahati. He departed from India after that and hoped to continue with Entella for the rest of the season. He made 9 appearances for the ISL 2017/18 winners Chennaiyin FC and provided one assist. However, the heart condition, the details of which are not yet known has caused a premature end to his career. Orlandi has made 45 appearances for Brighton and Hove Albion during the club's time in the English Championship. Before that, he helped Swansea gain promotion to the Premier League in the 2010/11 season. He scored after just 25 seconds against Wolverhampton Wanderers (Wolves) in the Premier League but joined Brighton after that. 😍 "Poetry in motion! "#BHAFC 🔵⚪️https://t.co/uXXD2Mi6YJ. In an interview with the Brighton website, Orlandi has said he could have almost died on the pitch. “I felt like this was coming after I had the medical but until it was made official I still had that glimmer of hope," Orlandi told Brighton. “Sadly it is not safe for me to play on and I was devastated when the doctor broke the news. However, I am coming to terms with it quite quickly and am so thankful to all the medical staff who have helped me. "I could have had an operation to try and carry on playing, but at 34 it would have been risky and stupid to do so. I have to think about my future more than football now. “The truth is I could have died during my career, so I must look at the bright side that I am still here with my wife and kids and that I enjoyed many years playing the game I love. Chennaiyin confirmed the news but said they would comment on the issue at a later stage. Orlandi and former Chennaiyin defender Inigo Calderon have been best buddies for many years now and played together in Brighton. Orlandi, a former Barcelona B player, made one La Liga appearance with the main squad on the final day of the 2005/06 season against Athletic Bilbao. He has also had stints in Blackpool, Anorthosis Famagusta and Apoel Nicosia (Cypriot First Division).